The edge of the coin is adorned with two wavy lines, separated by a rhombus. The small diagonal of the two rhombi is vertical. 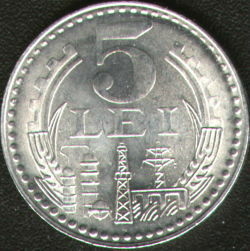 The aluminum 5 lei coin of 1978 has several variants : type 1, the tripod having equal length legs (common type), type 2, the leg at the left side (of the picture) being shorter and type 3, this time the leg at the right side (of the picture) being the short one. 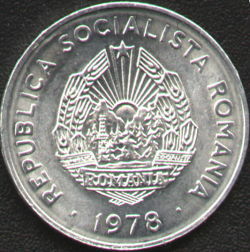 The information reguarding the variants as well as the explanatory pictures were provided to Romanian coins by Mr Adrian Popovici.